The sign is up on the shop that is and I'll take a picture of it tomorrow as I only got a partial picture today. 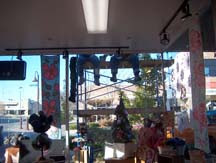 Here's a pic, from inside of the store, of hubby, on the right, and our neighbor, sitting on the scaffolding putting the last of the screws into the sign. Btw - blogger is having some problems tonight so if you thought it was you it probably isn't!